Police in Israel have announced the arrest of two West Bank Palestinians accused of killing two Israeli settlers by throwing stones at their car. The car driven by Asher Palmer and carrying is his infant son crashed near Hebron last month. The arrests were announced after police said they were holding a Jewish youth over an arson attack on an mosque. 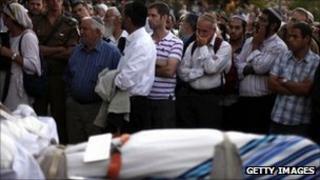 That attack, in an Arab village in northern Israel, appeared to be in retaliation for the Palmers' deaths. As well as the two Palestinians arrested for throwing the stones that caused the Palmers' car to crash, three other Palestinians were arrested for taking a gun from the car after the crash. Police said they had recovered the weapon. Initially, the Israeli army issued a statement that the crash on 23 September had been the result of an accident. Israeli police later revised this, concluding that the car came off the road after rocks had been thrown at the vehicle. The torching of the mosque in the northern Israeli village of Tuba-Zangariya, appeared to be in retaliation for the deaths of the Palmers. The words "revenge", "price tag" and "Palmer" were reported to have been written in Hebrew on the mosque walls. There has been a spate of similar "price tag" attacks recently, carried out by suspected Jewish extremists against Palestinians in an attempt to deter the Israeli government from closing West Bank settlements. Israeli media reported that an Israeli who was studying at a religious seminary at a West Bank settlement had been arrested over the mosque arson attack. Their presence is a major obstacle to peace talks as the Palestinians insist Israel freeze settlement building before renewing negotiations.